10 days of 4-star hotels in Italy for free! This is the second of several posts about our recent trip to Italy. In this post, I will explain how we booked all of our hotels in Italy on points. If you haven’t read about how we flew to Italy for free, click the link below! We stayed in 6 different hotels in Italy. I know, it sounds exhausting but it was easier and more enjoyable than I thought! Packing in a carry on helps if you’re going to be staying in different regions and/or hotels. I’ll explain how I was able to pack in only a carry on and a backpack in a separate post. In this post, I will list each of our hotels and how many points we redeemed. When I post about each region we visited, I’ll list options for hotels that you can book with points such as Starwood and Hilton. 5 of our hotels were 4 star hotels, and one of our hotels was 3 stars. As I’ll explain below, you certainly can get hotels for cheaper (less points) than we did. Also, just because a hotel is a 2 or 3 star hotel does not mean that it’s a bad hotel! Likewise, a 5 star hotel does not always guarantee a great experience. I guess what I’m trying to say is you don’t always have to spend a lot of points to get a great hotel! Always check reviews on sites such as TripAdvisor so that you know what you’re getting. 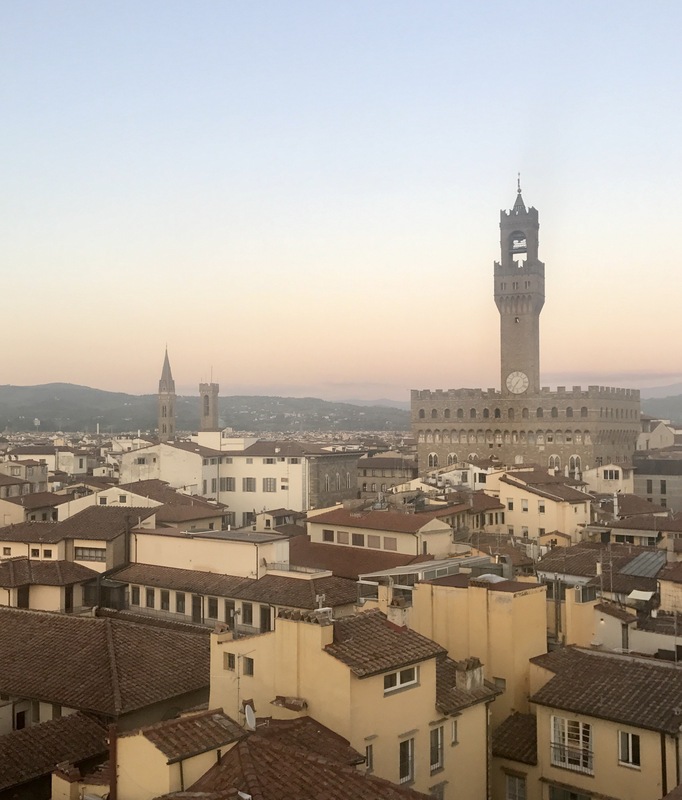 Sunset views from the rooftop patio on top of the tower at our hotel in Florence. Not bad for 13,000 points per night! Chase Ultimate Rewards is the real MVP here! Although there are some great options for hotels in Italy with my usual go-tos such as Starwood, we ended up booking all of our hotels with Chase Ultimate Rewards points. As I say all the time, I generally consider anything worth about 2 cents per point a good deal. There are some exceptions and this is one of them. Chase Ultimate Rewards can be redeemed for travel two different ways. First, you can transfer Ultimate Rewards to airline and hotel partners such as United and Hyatt. The other option is to book travel on the Chase Ultimate Rewards website and essentially use your points as cash. Click here for more information about when I would and would not use each option, and see the Hyatt example below. Since we have the Chase Sapphire Reserve card, those points can be used as cash to book flights and hotels through Chase’s redemption portal at a rate of 1.5 cents per point. Although that’s not my usual 2 cents per point, I’m fine with doing this occasionally for a few reasons. First of all, you will have way more options when booking through the Chase Ultimate Rewards portal. You can book a one star or a five star hotel, and anything in between. The points cost will depend on the cost of the hotel since you’re basically using Ultimate Rewards points as cash. The Chase Ultimate Rewards redemption portal gets their inventory from Expedia. So basically, if a room is available on Expedia, you should be able to book it through the UR portal. Second, we have so many Ultimate Rewards points from everyday spending (thanks category bonuses! ), shopping portals, and the 100,000 points we recently received for closing on our new house. Since we often earn 3 or more Ultimate Rewards points per dollar, I don’t feel as bad redeeming them at a rate of 1.5 cents per point. In other words, Ultimate Rewards are so easy to earn. We wanted to book our hotels on points, and there are several options with chain hotels such as Starwood Hotels. For example, we could have stayed at the Westin or the St. Regis in Florence, but we value Starpoints higher than Chase Ultimate Rewards. Starpoints are not as easy to earn as UR so we wanted to save our Starpoints for other trips we are planning. Finally, this may not sound like much but breakfast is included for several hotels in Europe. It is important to note this when you’re booking on Chase’s website because not every hotel includes this. But all of the hotels we booked did include breakfast for 2. Since breakfast averages around 15 Euros per person in Europe, this can add an extra 30 Euros to the value you’re getting. Overall, this increases the value of your Ultimate Rewards points. It is important to note that if you have the Chase Sapphire Preferred rather than the Chase Sapphire Reserve, your value is going to be 1.25 cents per point when booking through the portal as opposed to 1.50 cents per point. This still may be a good option but you may get more value by transferring points to loyalty programs. One of my favorite ways to use Chase Ultimate Rewards is to transfer the points to Hyatt and then use Hyatt’s loyalty program to book free hotel nights. Hyatt’s award chart allows for some great redemption value opportunities, especially at high-end properties. Unfortunately, there is currently only 1 Hyatt property in Italy and that is the Park Hyatt in Milan. While I would love to stay at that property, we did not go to Milan. But if anyone is interested, this is a great example of when I would prefer to transfer points to a program to book rather than booking through the Ultimate Rewards website. The lowest rate for a Park King room is 590 Euros per night. Currently, that is over $700 USD. If we were to book a 700$ hotel room through the Ultimate Rewards booking portal, it would cost about 47,000 Ultimate Rewards points if I have the Chase Sapphire Reserve. Remember that with the Chase Sapphire Preferred, points are worth 1.25 cents per point rather than 1.5 cents per point. As a result, this room would be even more than 47,000 points. On the other hand, I could transfer 30,000 points to Hyatt, and then use my Hyatt account to book this room. Hyatt, please add more hotels in Italy! Ok, back to our trip. Here are the hotels we booked in Italy and how many points we redeemed. I will go into a little more detail about each hotel when I post about each city we visited. In those posts, I will also give other hotel options that you can book on points such as Starwood and Hilton hotels. We redeemed ~26,000 points per night for this hotel. The cash value of a night at this hotel is ~$390. Hotel American Dinesen is a 4 star hotel in a great location in Venice. It is on a quiet canal, and we were able to walk everywhere from this hotel. Breakfast was also included in that price. Another view of Hotel American Dinesen. We redeemed ~13,600 points for a ~220$ room which included breakfast. Hotel Torre Guelfa is a 3 star hotel near Ponte Vecchio in Florence. This one was interesting and my feelings about it are mixed. Ryan and I got a room that was a little old and outdated but it was kind of charming. It was pretty big and it had a separate parlor room with a couch that actually could have slept another couple. We joked that if our friends’ room was too terrible they could stay in the parlor. Our room was more like a suite. Our friends who booked the exact same room as us (through the Chase Ultimate Rewards portal of course) had a smaller room and it was very outdated. It seems to be kind of a crapshoot as far as rooms and that’s what it sounds like based off of TripAdvisor reviews as well. But, we ended up having a really fun night in Florence. We had happy hour on the rooftop patio of their 800 year old tower to watch the sunset. Then we walked to a restaurant for a great dinner and after dinner, we went back to the hotel and had wine on the rooftop patio of the tower. The tower had great views of the city at sunset and at night. We redeemed ~21,500 points per night for this hotel. The value is about $323 per night including breakfast. Relais Vignale is a 4 star hotel in the Chianti region. This is a great example of why it’s so hard to place a value on points. We all loved this hotel. It was charming, full of character, and in a great little spot in the village of Radda in Chianti. Honestly, I would have expected the cash price of this hotel to be higher. So to me, 22,000 points a night is a great value. Patio bar at Relais Vignale. Pictures don’t do the views justice. View from the restaurant at Relais Vignale. Again, photos don’t do it justice. We redeemed ~26,000 points per night for this hotel. The value when I booked was about $390 per night including breakfast for 2, but now it looks like its closer to $500 per night. Hotel Villa Gabrisa is a 4 star hotel in a great location in Positano. Although it was right next to where the bus to the center of Positano picks up, it was an easy walk to the center and the port. I definitely think 26,000 points per night with breakfast included was a fair value for this hotel, considering hotels in Positano often go for $500 and above per night. Plus, you cant beat the breakfast views. ~26,300 per night for a room that costs ~$395 per night. Relais Maresca is a 4 star hotel that sits just above the Marina in Capri. It is very convenient if you’re wanting to do a quick trip to Capri. From the ferry, you just have to walk a few steps to get to the hotel. It is also right next to the funicular. The funicular is the railway that runs between the marina and the city center at top of the island. This hotel was great and yet another example of why I would consider 26,000 points worth it even thought it’s not my usual 2 cents per point threshold. Tip: I do not think I have covered this enough so I’m going to start now. Anytime you’re staying at a hotel, it’s always a good idea to email the concierge ahead of time to let them know if you’re celebrating a special occasion. Some people do this on the regular to get freebies, which is fine, but I try to stay honest about it. If we’re celebrating a birthday or anniversary, I tell them! You may just get a nice note and verbal congratulations at check in, but you also may get room upgrades and more. For example, last year in Napa, the Andaz Hyatt gave us a suite and placed a bottle of Champagne and chocolate covered strawberries in our room because I informed them that it was Ryan’s birthday. I did this when I emailed the concierge to inquire about balloon rides (which we were able to do since we spent almost nothing on flights and hotels for that trip!). I emailed Relais Maresca a few weeks before arrival to inquire about private boat tours. In the email I casually mentioned it was our 6 year anniversary. We ended up with a bottle of champagne and some chocolate Capri cake in our room after our boat ride! Champagne and Capri cake for our anniversary! We redeemed ~15,500 points per night for a room that is normally $233 per night. This includes breakfast for 2. Hotel Napoleon in Rome is a 4 star hotel located close (but not too close) to the train station. I booked this hotel because I wanted to minimize our time in transit. We only had one day in Rome after arriving via train. We were flying out the next day so had we wanted to take the train to the airport, we were in a convenient location. The hotel is walking distance to the train station, and it is also walking distance to all of the things we wanted to see in Rome. The concierge gave us a map and marked out an efficient walking route so that we could see everything we wanted to. I was so excited to see the Colosseum that I forgot to take a photo of the hotel. This photo is courtesy of the hotel’s website. While I am normally not a fan of booking through Chase’s redemption portal, we stayed in some great hotels for free! As I stated, there are other ways to book hotels in Italy on points. I will give other options for each place we visited in the posts about each individual region/city. Want to earn 50,000 Ultimate Rewards bonus points? ← How we flew to Italy for (almost) free… and you can too!